HOKA ONE ONE (www.hokaoneone.eu) have taken a very different direction to the minimalist trend in shoes that has been prevalent in recent years. For HOKA, oversized is the word. With more than twice the level of cushioning than traditional running shoes, that is clear in their design; they look very different. For some, they look too different, with plenty of runners having a chuckle at their non-standard approach. I've been aware of HOKA's for a while, seen them at a few shows over recent years, but until recently not actually trialled them myself. Released last year, the HOKA CLIFTON is the lightest shoe HOKA have ever produced, claiming "incredible cushioning at an almost impossibly light weight". With a history originating on the trails and in ultra running, the Clifton is HOKA's road shoe to "take the feeling of running on grass to the concrete jungle." 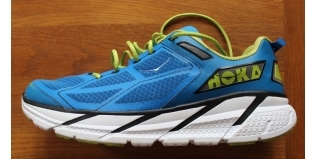 This is the shoe in question, claimed by HOKA as "quite possibly the smoothest-riding shoe on the market". Ok, so how was it? A debut HOKA user, for the first five minutes of my first (treadmill) run I thought I had a mattress under each foot, it was slightly weird. Incredibly cushioned, but weird... Once past that initial sensation though, all I've done is smile every time I put this shoe on. Steady runs, long runs, treadmill intervals, (mild) off-road and racing - I've done all of those in this shoe in recent weeks - and it delivers every time. For what (visually) appears a 'big' shoe, the weight (lack of) is really quite something. It's almost an optical illusion - how can a shoe that seems big actually weigh so little? HOKA quote 217g for a men's size 9 and 185g for a women's size 7. I haven't put them on scales to validate the manufacturer claims - but take it from me, it's light (even in my vast size UK 12). When I pick up my wife's UK 6, the lack of weight is even clearer. That's great, but it's not the weight that 'makes' this shoe - there are plenty of light(er) options available from other brands if your only consideration is the scales. What makes it so good is to combine superb cushioniong AND a great ride too. The shoes have a 5mm drop, with a 29mm heel and 24mm forefoot, so still in the HOKA 'oversize' category. This provides spongy, soft cushioning - but does so without eliminating all contact of the road / trail / treadmill. I would have expected such a degree of cushioning to all but eliminate 'feel', but somehow in this shoe it doesn't. It's a very natural, smooth ride, with the midsole CMEVA material doing an amazing job. The quality of manufacture appears excellent - it's a good looking shoe (personal opinion...), which from my use so far, is not showing any indications that it's weight has been compromised for durability. As mentioned above, as my first HOKA shoe I haven't any previous experience of how they fit in terms of typical sizing / width. 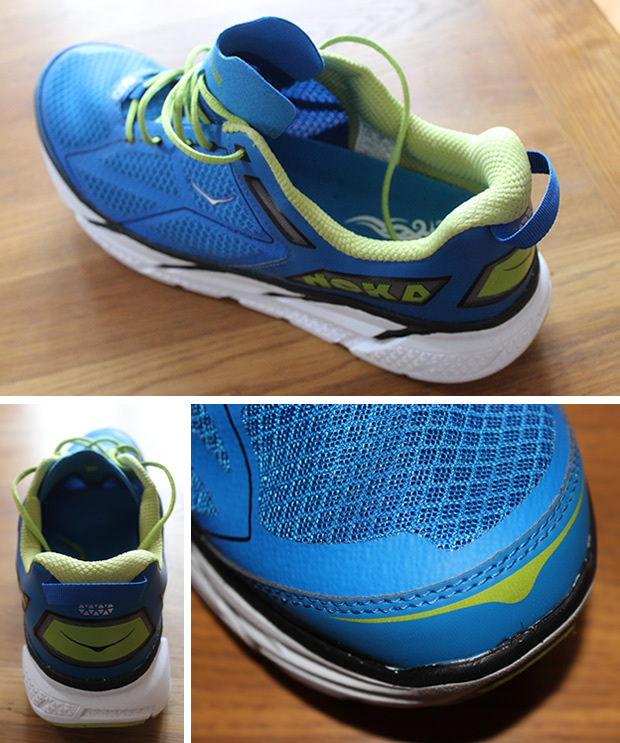 I've found over time that ordering almost anything in a EUR47 will almost always fit me (I've all but given up quoting UK/US sizes as these seem to vary wildly), and on reviewing the HOKA fit chart (which includes US, UK, EUR and mm sizing), versus my current shoes, I decided that the 297mm/EUR47.33/UK12/US 12.5 should fit - and indeed it did. I ordered the woman's edition for my wife using the same logic against her current shoes (she's a EUR39 typically in Asics which she has used from many years, and the HOKA equivalent was a 245mm/EUR39.33/UK6), and again they fitted perfectly on arrival. So, for us at least, using that sizing chart got us to the correct fit first time out. While I have feet the length of ski's, they are quite narrow. The Clifton's fitted me well, though I would say that the laces were starting to pull both sides of the upper quite close together. Not an issue for me - and clearly, the shoe can deal with feet a lot wider than mine - but if you have really narrow feet, you might want to check this element out. One of several areas of the shoe that is paired down to save weight is the tongue - and this is one area that did give some fault (and not just in the 'blue' model - the same issue arose in the woman's 'plum' edition). 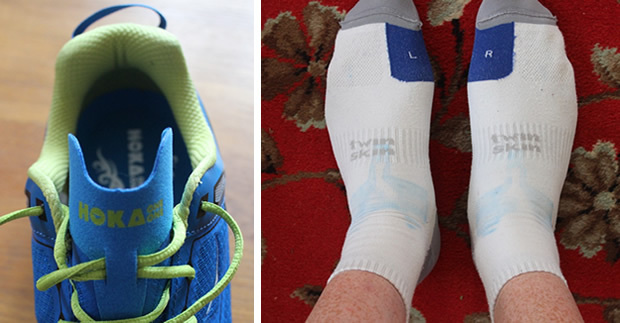 During use, the colour from the tongue did run, causing (non-permanent) colour transfer to socks - and not just in the wet. A trip back to the dye house for some R&D before the next iteration of this shoe might be a good idea. Without wearing these for the life of the shoes (and, well, finding out what that life is...), it's difficult to put a definitive thought on likely durability. As mentioned above, quality of build seems excellent, and I've found no issue with seems or joins for example to far. Much of the outsole is effectively the exposed midsole CMEVA material - which is what provides the signature cushioning - with some areas of green (at least, on my blue shoes...) higher abrasion rubber. That will be something to keep an eye on, and logically perhaps the area where durability issues may be seen first. So far so good for me, and certainly no worrying signs 100km later. One thing is for sure, I will be wearing these for a long time beyond this test to see how long they do last. The UK RRP of this shoe is £99.99, and I think that is a reasonable price for such a great performing shoe. Further, a 20 second web search will find the shoes widely available from several outlets at at £10 less than that - even better. If you are really lucky - and I've done it myself in the past three weeks - there are (or were), online stores selling the Clifton for £79.95. That is bargain central. The HOKA Clifton is not a good shoe. It's not even a very good shoe. It is a GREAT shoe. 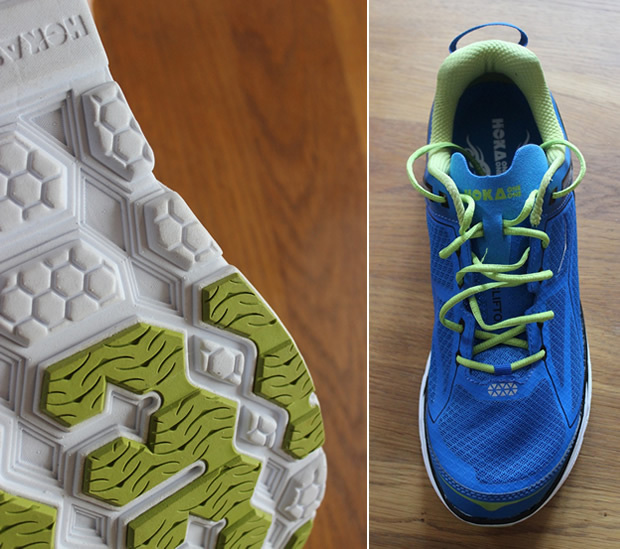 Seriously, this is definitely a contender for the best running shoe I have ever used - it's absolutely superb. 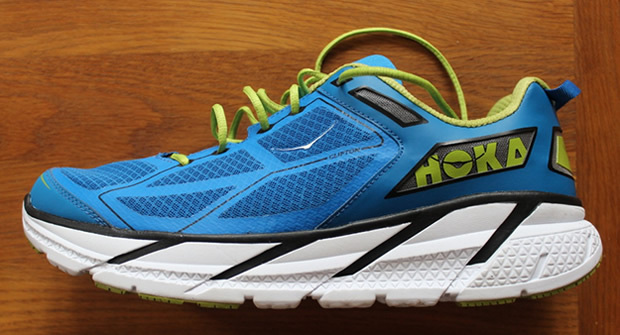 HOKA make big claims for this shoe - but its performance backs them up. For triathletes racing middle and long distances, this could well be the perfect racing shoe - lightweight, but with stunning cushioning which your tired and battered legs will thank you for as you enter the second half of your 70.3 or Ironman. For me, this is also a suitable everyday shoe too. With a few more years on the body and kilo's on the waist, the cushioning is a very welcome addition, yet the feeling of fluidity and smoothness is not compromised for that. HOKA have just released a new shoe based on the Clifton called the Challenger ATR (see more on that HERE), a lightweight trail running addition with 3mm lugs for off road grip. That sounds like it has 'winner' written all over it to me - and would be a welcome addition to my typical towpath and parkrun outings. Hopefully we'll have that in to test soon. If you've ever seen HOKA shoes and had a little chuckle and thought 'clown shoes' - think again, these are the real deal.